June 25, 1876 , American Indians defeat George Custer at and the U.S. Army at Little Bighorn, which is in southern Montana. The U.S. Army had been forcing American Indians onto reservations, but there were resistors led by chiefs Sitting Bull and Crazy Horse. As Americans moved West, Indian nations had repeatedly entered into treaties with the U.S. government but the terms changed as more and more people moved West. Then gold was discovered in South Dakota’s Black Hills in South Dakota, which had been considered sacred ground to plains Indians. In 1875 the U.S. Army was said to have ignored treaty provisions and invaded the Black Hills. That prompted many plains Indians to leave their reservations and join Sitting Bull and Crazy Horse in Montana. Battle lines were drawn. In late 1875, the U.S. Army ordered “hostile Indians” in Montana to return to their reservations or be subject to attack. Sitting Bull and Crazy Horse ignored the order, then urged other warriors to join with them to fight the army. 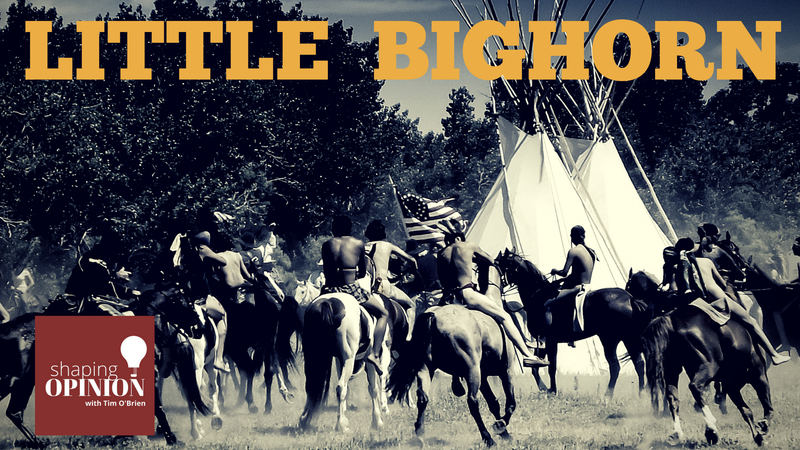 By late Spring 1876, thousands of American Indian men, women and children had gathered at a massive camp along a river in Southern Montana called Little Bighorn. On June 17th, General George Crook of U.S. Army was stunned by size and ferocity of the Indian attack nearby and pulled back. Two other Army columns remained, one commanded by General Alfred Terry and one by General John Gibbon. General Terry ordered the 7th Cavalry under Lt. Colonel George Custer to scout ahead. Instead of proceeding cautiously, he dismissed his scouts when they told him of a gigantic Indian village nearby in the valley of Little Bighorn. Believing that there was a village but discounting its size, his main fear was that when word got to the village, the people would scatter before he could emerge victorious. He divided roughly 600 men into three battalions, keeping about 215 under his direct command. He did this to keep the Indians from scattering to escaping his invasion. The people did not scatter, they mobilized. Sitting Bull was too old for battle, but younger Crazy Horse sped into battle with a large force to meet the U.S. Army. With Custer’s troops divided and advancing, they found it was they who were under attack by a rapidly growing number of warriors. Custer and the others had tried to regroup his regiment but it was too late. Everyone was under attack. Custer himself, and his 215 men were cut off and under attack by as many as 3,000 armed braves. In less than a 2 hours, they were all killed to the last man. Other regiments survived with heavy casualties but were able to hold for a day until the Indians withdrew. There were 50 known deaths among Sitting Bull’s followers. While the Battle of Little Bighorn was the greatest victory for the plains Indians, and the army’s worst defeat in what was called the Plains Indian War, the Indians were not able to revel in victory. The story of “Custer’s Last Stand” outraged many Americans and created national perceptions of merciless Indians. In less than 5 years, almost all of the plains Indians were confined to reservations. 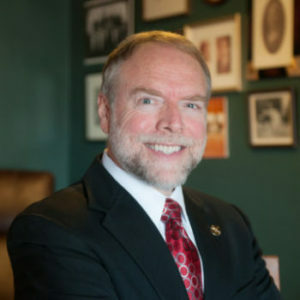 About this Episode’s Guest Andrew Masich, Ph.D.
Andy Masich is President and Chief Executive Officer of the Senator John Heinz History Center and a commissioner (former chairman) of the Pennsylvania Historical and Museum Commission. Under Andy’s leadership, the History Center has been recognized for its award-winning exhibitions and innovative educational programs. He has forged strategic partnerships with the Smithsonian Institution, the Commonwealth of Pennsylvania, Allegheny Conference for Community Development, Boy Scouts of America, VisitPittsburgh, American Association for State and Local History, and 125 History Center affiliate museums in Western Pennsylvania. Andy is an adjunct Professor of History at Carnegie Mellon University and is a recognized authority on the preservation and interpretation of history. 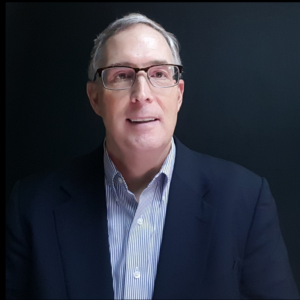 He has served on the American Alliance of Museums Accreditation Commission and as a faculty member of the prestigious Seminar for Historical Administration. He makes regular television appearances on KDKA (CBS), including the popular “Pittsburgh’s Hidden Treasures” programs and the regular feature, “Pittsburgh History Today.” Known for his extensive knowledge of Pennsylvania history, he has also authored or co-authored award-winning books on a wide range of subjects. His newest book, Civil War in the Southwest Borderlands, 1861-1867 (University of Oklahoma Press, 2017), delves into the multicultural and transnational dimensions of the conflict in the American West and Mexico.